What better way to spend your relaxing vacation than in a charming beach cottage? 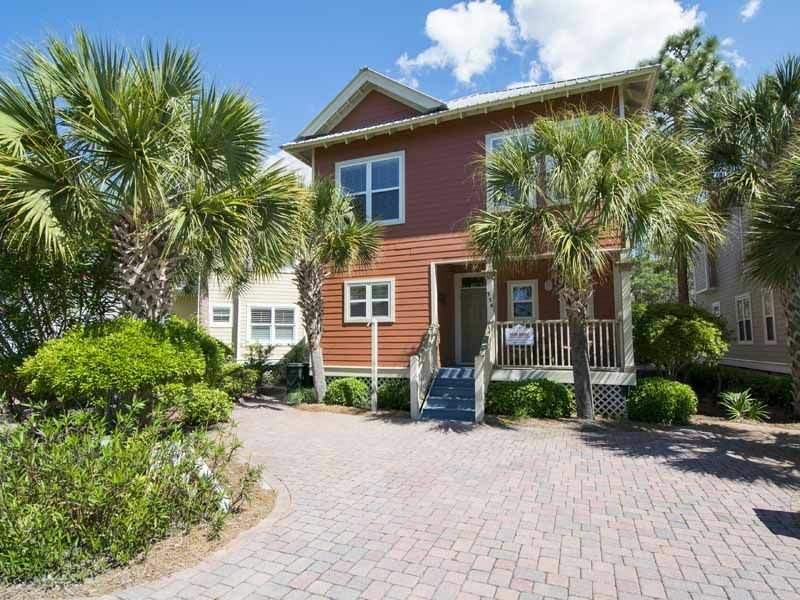 Sunny Delight Cottage is a three bedroom, two and a half bathroom cottage in Santa Rosa Beach, Florida that sleeps up to 8 people making it the perfect location for a family vacation. On the first floor you will find a spacious living room with a queen sofa sleeper. Walk up the stairs and find the master bedroom, furnished with a king bed, the second bedroom with a queen bed and the third bedroom featuring twin bunk beds. Enjoy the two neighborhood community pools or walk down to the beach and soak up the sun on the sugar white sand. Very poor accommodations and extremely dirty with lots of problems. Upon walking into the property we were very upset with the dirty conditions of the property. Carpet, cabinets, and furniture were extremely dirty. Both bathrooms had mold on the ceilings. Stains on all the carpets upstairs and down. After a few days we realized the upstairs air was not working. During the night I heard water dripping and at 4am in the morning I was scooping water out of the drip pan under the furnace upstairs. Called SVR and two people were out at 8:30am. When Luke took the filter and screen out of the furnace it was moldy and very dirty. He told us the furnace was froze up and SVR sent a heating and cooling guy out to fix it. He also changed the downstairs unit that was extremely dirty. The outside unit was also froze up. The only reason we stayed was because we had friends at a local camp ground. The pans in this place were so worped that on the flat stove you had to hold them . On line this place looked great, but that was certainly not what we rented! Also, when I started wiping the kitchen counter upon arrival it had something like syrup all over the counter. I certainly would like the cleaning refund back. Never again will we rent. Thank you for this feedback Andrea. We are so very sorry that this vacation did not meet your expectations or our Southern standard. Thank you for reporting these issues to us and allowing us to come out and address them all. We are happy to report that since the AC has been replaced there have been no other issues with it. We do hope that we will see you again in the future to show you a vacation that meets the true Southern standard. The location in Santa Rosa is wonderful. Both pools were excellent, and even the house’s location within the neighborhood is very desirable. However, there were lots of little things that made our stay less than perfect. I should note this is the first rating I’ve ever given that was less than five stars on VRBO so I feel I am a pretty understanding and tolerant guest. All communication was done via text and email. I tried several times prior to the trip as well as during our stay to call. I never once received a call back nor can you ever talk to anyone in person. The property manager, obviously in an attempt to be efficient, has over-corrected and talking to an actual person is impossible. Very frustrating to say the least. For the first day we were there, the Internet didn’t work. The house is very sparsely stocked. No extras of any kind. Granted there are cups and plates and bowls. But as in the case with so many other rentals where there are plenty of extras to give it a homey feel, this rental had none of that. The towels and linens and sheets are all minimum quality. The carpet is soiled in several places from previous pets and the walls are scuffed up throughout the house. None of this is terrible - it just means this rental is just “Ok.” I would suggest finding another rental in the same neighborhood that has a more responsive property manager. Thank you for taking the time to review your stay with us Mike. We always appreciate our guests feedback and are always looking for ways we can improve. We have updated our listing to include what we leave in the home as a starter kit and what we recommend our guests bring with them. This list can also be found in the guest portal that all of our guests have access to. We offer text and email communication as a convenience to our guests but everyone is always welcome to call with any questions or concerns. We are happy to hear that you enjoyed the location and the neighborhood pools. We hope to see you at Sunny Delight Cottage again! We loved our stay at Sunny Delight Cottage! Easy to bike to town center, beach, restaurants. House had everything we needed for a wonderful, relaxing week at the beach. Thank you for your review and feedback. We are glad to hear you had a great experience. We hope that you come back next year for another memorable vacation! We loved the coziness of the house and neighborhood. Loved the location of sunny delight. Enjoyed biking, running, swimming and going to the beach. The house was plenty big for our family. We did have an issue with the air conditioner not working. We called and left messages with no reply. We had to call back twice and they sent someone two days later. The grill was to nasty to use and that was disappointing. The cleanliness of the house was not up to expectations. Lots of dust, dirty shower curtains and mold around the vent in the master bath. But overall my family had a wonderful time and enjoyed our stay. Thank you for taking the time to leave us this feedback. We are so happy to hear that you and your family enjoyed your vacation and all the wonderful activities available in 30A. Thank you for reporting the issues you experienced with the AC and allowed us to repair it while you were still in town. We've passed your comments about the grill and cleanliness to management. We do hope to see you again in the future! Other than weather, property was great. Staff and maintenance very responsive. Roomy and fun. Very roomy and wonderful place. Staff was super friendly and fixed the only issue we had quickly. LOTS of rain during our stay, but the house was cozy and fun with plenty of room for our family of six. Would go back to this property again. Hi Wade! Thank you for your review! We are sad to hear that it rained during your stay at the beach but am delighted to hear that your family enjoyed the vacation home. Also glad to know that management was responsive and efficient. We look forward to your next stay! Thanks again! Very clean. Convenient to beach and town. Ceiling fans on back decks would be a nice addition! Thank you for your review! We are happy to hear that the property met your expectations of cleanliness and location. We will see if there is anything management can do about adding fans to the back deck! We agree they could be an excellent addition to the home. Thanks again!